It’s been six months since the beautiful NORTHSIDE espresso and kitchen opened its doors on the north side of princess just east of clergy. It has been such an incredible addition to Princess street, with it’s beautiful, plant-filled, insta-worthy space, delicious food and amazing coffee they acquired admirers from the very start. Owners Jess and Cade moved from Melbourne, Australia to be closer to Jess’s family and brought their passion for their regions’ coffee cafe culture to Kingston. I’ve found a few common traits that run through these boss lady interviews: passion, the courage to dive into something new and the appreciation for support that the Kingston community offers. And Jess and Cade are no different. They clearly love the new life they’ve built with NORTHSIDE and it’s clear in the vibe that is felt whenever I stop in for a drink or a bite. Below, they reflect on the last six months and explain how they got their start and what they love about being small business owners in Kingston. KUWK: When did you start to think about NORTHSIDE and this concept? Jess: I think the seed of the idea was always floating around in our minds, particularly because I grew up in Sydenham/Kingston. Whenever we would come home for a visit or something we felt like we were missing something. There was a gap for us in terms of getting that cafe culture. I know there are lots of coffee shops here which are great but we also wanted to have a breakfast with great coffee. Cade: And I think we found there were lots of places that would do great coffee or great breakfast, but there was nothing that did the two together. And that’s what we were used to at home, always having the two at the same time. Jess: It’s such a routine at home, you go to your cafe and order your first coffee while you’re waiting for your breakfast and then you have that coffee and have your breakfast and then you’re like, “okay, where’s my second coffee?” It’s just such a thing. So coming back home from visiting my family and stuff, we would always talk about how it would be great to do this and particularly seeing the rise of it in New York and North America — a lot of Australian cafes have popped up in the last three or four years and have done really, really well. We thought, “Kingston can support something like that.” With the students and with the community that Kingston has which is really open minded with artists and locals. All of that sort of stuff. We thought there is no reason Kingston couldn’t support something like that.” It was more of a conversation until we got to a point where we knew were coming home. As soon as we knew we were coming back for sure, it was about making that conscious decision of if we have this opportunity to do something we want to do it. Cade: And something that’s so different than what we were doing at home. It was a bit like we were going to change our whole lives anyway so would you do the same career or would you do something different. KUWK: What were your careers? Jess: I worked in a financial institution, one of the big four banks and I worked in executive coaching and change management comms and a lot of operational team management stuff. I have to say, the transferable skills to run your business and people within your business are very transferable. Cade: And Jess, you’re the main one that manages people and our team and finding the balance of everything. I ran workshops for teenagers, so I would be working with 14-year-olds maybe like 120 at a time. Full day workshops on global citizenship or leadership and self esteem. Jess: So I was very corporate and Cade was not for profit and now we’re small business owners! KUWK: How long were you here before you got the ball rolling on NORTHSIDE? Jess: Once we knew were were moving we were constantly thinking about it and looking at how we could do it. It was more about keeping our eye out for the right space. And just understanding what we wanted to do and what Kingston already had because we didn’t want to do the same thing because what was going to make us different – we did a lot of research around that. We were here almost a year. Cade: Yeah, we got here in February of last year and then work started on the space in October. Jess: We felt really fortunate for finding this space, it was kind of everything we wanted. But I am also really glad we didn’t find anything right away because I worked at Chez Piggy for that time and Cade worked at Coffeeco and I think if we hadn’t done that we would have found this process incredibly difficult. Just the little things that we wouldn’t have known to think about and to do. Cade: Yeah, and also getting to know locals and people and what people are looking for and understanding the culture – especially for me because I didn’t grow up here. Coffee is very different in North America compared to Australia. Jess: Hospitality is different in general so it was an invaluable time that we spent working in each of those places. Looking back I wouldn’t change it because I think it added so much of what we could bring and what we knew we wanted to do whether that be similar or different. What do you think the benefit has been being in Kingston? Jess: I think being in Kingston – especially moving from Melbourne – I think people try to put their arms around you a little bit which we’ve felt. We feel really blessed that people have embraced us as much as they have. Cade: I think we were surprised at the support of other local businesses because in a big city it can be a bit more cut throat and a bit more competitive. Whereas here, you’re all going to see each other and talk to each other. Jess: We are all backing each other. That kind of relationship with each other – each small business owner. I also feel really fortunate to say within six months of opening, we have a steady stream of regulars. So it’s also the support of the community from that perspective that’s been amazing. It’s awesome seeing the same faces come in all of the time but also you get that influx of students and it sort of gels. We have such a varied demographic in here that it doesn’t feel like it’s just a local place or just a student place which makes me feel like people like the vibe so they want to be here which kind of reiterates why we’ve done it. KUWK: Is there anything you’d like to add about running a small business in Kingston? More examples of what you have enjoyed? Cade: I think part of us wanting to open something like this was to build our life here so it’s a bit of being able to meet people, meet people who are similar and I think it adds to our life. Jess: It’s not really just a small business, it’s our lives and everything we had went into this. Cade: And making friends as an adult is really hard and a strange thing to have to do once you’re out of high school. It doesn’t happen that often. I think that’s the beauty of this at least. I didn‘t know anyone moving here beside Jess and her family. Jess: I think also because we are a small business, we’ve got a smaller team, and this sounds a bit cliche but it really does feel like a family in here so it’s really nice having a tight, small team. We can all have a laugh but we know when to get on with what we need to do. When I have to be a boss, I have to be a boss and they all realize that’s happening at that time. Cade: I think the bottom line for us is about the connection with people. Jess: Prime example of Kingston as a community: Marty – our head chef – the only reason we knew him and got him here is because of a family friend of mine who introduced me to his partner who runs LSP Designs who we wanted plants from and it kind of all just led back to Marty. But seriously this business wouldn’t be what it is without Marty as well. Cade: Finding these people — a lot of the people who work here — we’ve found through a friend. Jess: Everything has come together organically with people that work here. It’s only recently that we’ve started advertising and putting it out there that we need an extra person in the kitchen and stuff. It kind of feels like “how do we do this?” because we didn’t start like that. That’s the thing about Kingston, it allows things to happen organically and it just comes together. That’s what I’ve found with these interviews is whenever you’re passionate about something there are always people to build you up no matter what as long as you have the drive, which you two clearly do, things happen. Jess: It feels like people are there helping along the way which is awesome. Anything you’d like to add reflecting on your first six months? Jess: I think just reiterating that the first six months couldn’t have happened without so many people around us. Whether it be my family or people we’ve met through family friends or people that we’ve worked with – we couldn’t have done it without a network around us. Whether we knew we were creating it or not. It came together. I don’t know how we would have done it if we just got here and started it by ourselves. I don’t think it would be the same. It wouldn’t have worked. One thing I’ve noticed since being back in town is how Kingston has grown out of the old “Florida of the North” stereotype. Sure, there are a lot of retired people who choose Kingston but there are also a ton of young people making their dreams come true – from business owners to writers and photographers. And perhaps I am a tad bias being a woman, but I am proud to see many of them are women! So I’ve decided to interview these successful ladies and find out exactly why they chose Kingston to flourish and the benefits of living in such a close knit community. 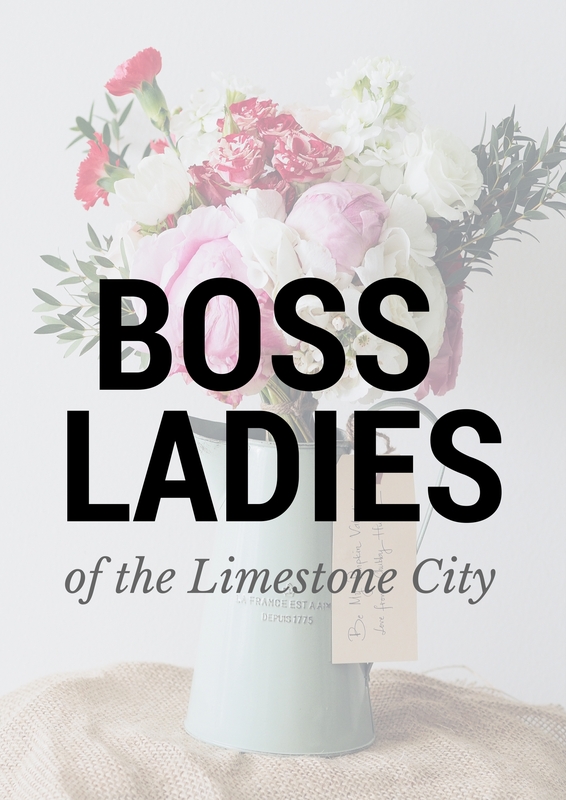 Click here to meet other Boss ladies featured in this series.